Many bundles need to save some data persistently - in other words, the data is required to survive the stopping and restarting of the bundle and OSGi Framework. In some cases, the data is specific to a particular user. For example, imagine a bundle that implements some kind of game. User specific persistent data could include things like the user's preferred difficulty level for playing the game. Some data is not specific to a user, which we call system data. An example would be a table of high scores for the game. Bundles which need to persist data in an OSGi environment can use the file system via org.osgi.framework.BundleContext.getDataFile. A file system, however, can store only bytes and characters, and provides no direct support for named values and different data types. Does not support a naming hierarchy. Only supports String property values. Does not allow its content to be easily stored in a back-end system. Has no user name-space management. Since the Properties class was introduced in Java 1.0, efforts have been undertaken to replace it with a more sophisticated mechanism. One of these efforts is this Preferences Service specification. The focus of this specification is simplicity, not reliable access to stored data. This specification does not define a general database service with transactions and atomicity guarantees. Instead, it is optimized to deliver the stored information when needed, but it will return defaults, instead of throwing an exception, when the back-end store is not available. This approach may reduce the reliability of the data, but it makes the service easier to use, and allows for a variety of compact and efficient implementations. This API is made easier to use by the fact that many bundles can be written to ignore any problems that the Preferences Service may have in accessing the back-end store, if there is one. These bundles will mostly or exclusively use the methods of the Preferences interface which are not declared to throw a BackingStoreException. This service only supports the storage of scalar values and byte arrays. It is not intended for storing large data objects like documents or images. No standard limits are placed on the size of data objects which can be stored, but implementations are expected to be optimized for the handling of small objects. A hierarchical naming model is supported, in contrast to the flat model of the Properties class. A hierarchical model maps naturally to many computing problems. For example, maintaining information about the positions of adjustable seats in a car requires information for each seat. In a hierarchy, this information can be modeled as a node per seat. A potential benefit of the Preferences Service is that it allows user specific preferences data to be kept in a well defined place, so that a user management system could locate it. This benefit could be useful for such operations as cleaning up files when a user is removed from the system, or to allow a user's preferences to be cloned for a new user. The Preferences Service does not provide a mechanism to allow one bundle to access the preferences data of another. If a bundle wishes to allow another bundle to access its preferences data, it can pass a Preferences or PreferencesService object to that bundle. The Preferences Service is not intended to provide configuration management functionality. For information regarding Configuration Management, refer to the Configuration Admin Service Specification. The PreferencesService is a relatively simple service. It provides access to the different roots of Preferences trees. A single system root node and any number of user root nodes are supported. Each node of such a tree is an object that implements the Preferences interface. This Preferences interface provides methods for traversing the tree, as well as methods for accessing the properties of the node. This interface also contains the methods to flush data into persistent storage, and to synchronize the in-memory data cache with the persistent storage. All nodes except root nodes have a parent. Nodes can have multiple children. The purpose of the Preferences Service specification is to allow bundles to store and retrieve properties stored in a tree of nodes, where each node implements the Preferences interface. The PreferencesService interface allows a bundle to create or obtain a Preferences tree for system properties, as well as a Preferences tree for each user of the bundle. This specification allows for implementations where the data is stored locally on the Framework or remotely on a back-end system. A set of properties in the form of key/value pairs. A number of child nodes. A valid Preferences object always belongs to a tree. A tree is identified by its root node. In such a tree, a Preferences object always has a single parent, except for a root node which has a null parent. The root node of a tree can be found by recursively calling the parent() method of a node until null is returned. The nodes that are traversed this way are called the ancestors of a node. Each Preferences object has a private name-space for child nodes. Each child node has a name that must be unique among its siblings. Child nodes are created by getting a child node with the node(String) method. The String argument of this call contains a path name. Path names are explained in the next section. Child nodes can have child nodes recursively. These objects are called the descendants of a node. Descendants are automatically created when they are obtained from a Preferences object, including any intermediate nodes that are necessary for the given path. If this automatic creation is not desired, the nodeExists(String) method can be used to determine if a node already exists. Each node has a name relative to its parent. A name may consist of Unicode characters except for the solidus ('/' \u002F). There are no special names, like ".." or ".". Empty names are reserved for root nodes. Node names that are directly created by a bundle must always contain at least one character. Preferences node names and property keys are case sensitive: for example, "org.osgi" and "oRg.oSgI" are two distinct names. The Preferences Service supports different roots, so there is no absolute root for the Preferences Service. This concept is similar to the Windows Registry that also supports a number of roots. A path consists of one or more node names, separated by a solidus ('/' \u002F). Paths beginning with a solidus ('/' \u002F) are called absolute paths while other paths are called relative paths. Paths cannot end with a solidus ('/' \u002F) except for the special case of the root node which has absolute path "/". Path names are always associated with a specific node; this node is called the current node in the following descriptions. Paths identify nodes as follows. Absolute path - The first "/" is removed from the path, and the remainder of the path is interpreted as a relative path from the tree's root node. If the path is the empty string, it identifies the current node. If the path is a name (does not contain a "/"), then it identifies the child node with that name. Otherwise, the first name from the path identifies a child of the current node. The name and solidus ('/' \u002F) are then removed from the path, and the remainder of the path is interpreted as a relative path from the child node. childrenNames() - Returns the names of the child nodes. parent() - Returns the parent node. removeNode() - Removes this node and all its descendants. node(String) - Returns a Preferences object, which is created if it does not already exist. The parameter is an absolute or relative path. nodeExists(String) - Returns true if the Preferences object identified by the path parameter exists. Key - A key is a String object and case sensitive. The name-space of these keys is separate from that of the child nodes. A Preferences node could have both a child node named fudd and a property named fudd. Value - A value can always be stored and retrieved as a String object. Therefore, it must be possible to encode/decode all values into/from String objects (though it is not required to store them as such, an implementation is free to store and retrieve the value in any possible way as long as the String semantics are maintained). A number of methods are available to store and retrieve values as primitive types. These methods are provided both for the convenience of the user of the Preferences interface, and to allow an implementation the option of storing the values in a more compact form. All the keys that are defined in a Preferences object can be obtained with the keys() method. The clear() method can be used to clear all properties from a Preferences object. A single property can be removed with the remove(String) method. The Preferences interface has a number of methods for storing and retrieving property values based on their key. All the put* methods take as parameters a key and a value. All the get* methods take as parameters a key and a default value. The methods act as if all the values are stored as String objects, even though implementations may use different representations for the different types. For example, a property can be written as a String object and read back as a float, providing that the string can be parsed as a valid Java float object. In the event of a parsing error, the get* methods do not raise exceptions, but instead return their default parameters. When a property for a Preferences object has not been set, the default is returned instead. In most cases, the bundle developer does not have to distinguish whether or not a property exists. A best effort strategy has been a specific design choice for this specification. The bundle developer should not have to react when the back-end store is not available. In those cases, the default value is returned without further notice. Bundle developers who want to assure that the back-end store is available should call the flush or sync method. Either of these methods will throw a BackingStoreException if the back-end store is not available. This specification specifically allows an implementation to modify Preferences objects in a back-end store. If the back-end store is shared by multiple processes, concurrent updates may cause differences between the back-end store and the in-memory Preferences objects. Bundle developers can partly control this concurrency with the flush() and sync() method. Both methods operate on a Preferences object. Stores (makes persistent) any ancestors (including the current node) that do not exist in the persistent store. Stores any properties which have been modified in this node since the last time it was flushed. Removes from the persistent store any child nodes that were removed from this object since the last time it was flushed. Flushes all existing child nodes. The sync method will first flush, and then ensure that any changes that have been made to the current node and its descendants in the back-end store (by some other process) take effect. For example, it could fetch all the descendants into a local cache, or it could clear all the descendants from the cache so that they will be read from the back-end store as required. If either method fails, a BackingStoreException is thrown. The flush or sync methods provide no atomicity guarantee. When updates to the same back-end store are done concurrently by two different processes, the result may be that changes made by different processes are intermingled. To avoid this problem, implementations may simply provide a dedicated section (or name-space) in the back-end store for each OSGi environment, so that clashes do not arise, in which case there is no reason for bundle programmers to ever call sync. In cases where sync is used, the bundle programmer needs to take into account that changes from different processes may become intermingled, and the level of granularity that can be assumed is the individual property level. Hence, for example, if two properties need to be kept in lockstep, so that one should not be changed without a corresponding change to the other, consider combining them into a single property, which would then need to be parsed into its two constituent parts. The PreferencesService is obtained from the Framework's service registry in the normal way. Its purpose is to provide access to Preferences root nodes. 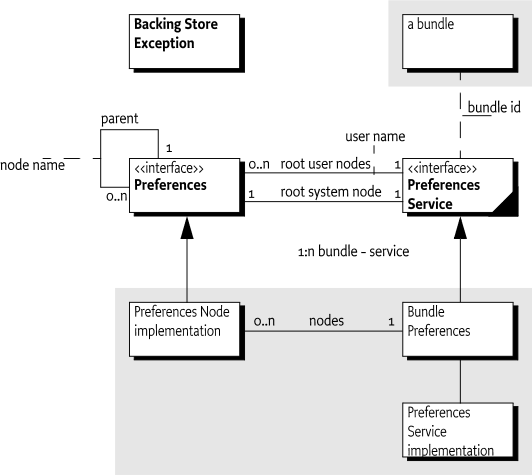 A Preferences Service maintains a system root and a number of user roots. User roots are automatically created, if necessary, when they are requested. Roots are maintained on a per bundle basis. For example, a user root called elmer in one bundle is distinct from a user root with the same name in another bundle. Also, each bundle has its own system root. Implementations should use a ServiceFactory service object to create a separate PreferencesService object for each bundle. The precise description of user and system will vary from one bundle to another. The Preference Service only provides a mechanism, the bundle may use this mechanism in any desired way. getSystemPreferences() - Return a Preferences object that is the root of the system preferences tree. getUserPreferences(String) - Return a Preferences object associated with the user name that is given as argument. If the user does not exist, a new root is created atomically. getUsers() - Return an array of the names of all the users for whom a Preferences tree exists. The Preferences Service must listen for bundle uninstall events, and remove all the preferences data for the bundle that is being uninstalled. The Preferences Service must use the bundle id for the association and not the location. It also must handle the possibility of a bundle getting uninstalled while the Preferences Service is stopped. Therefore, it must check on startup whether preferences data exists for any bundle which is not currently installed. If it does, that data must be removed. Preferences Service Package Version 1.1. BackingStoreException - Thrown to indicate that a preferences operation could not complete because of a failure in the backing store, or a failure to contact the backing store. Preferences - A node in a hierarchical collection of preference data. PreferencesService - The Preferences Service. Thrown to indicate that a preferences operation could not complete because of a failure in the backing store, or a failure to contact the backing store. □ Constructs a BackingStoreException with the specified detail message. cause The cause of the exception. May be null. □ Returns the cause of this exception or null if no cause was set. cause The cause of this exception. □ Initializes the cause of this exception to the specified value. Throws IllegalArgumentException– If the specified cause is this exception. IllegalStateException– If the cause of this exception has already been set. 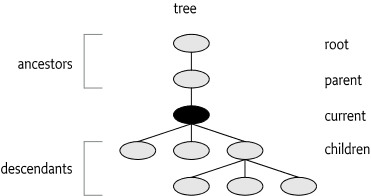 Nodes in a preference tree are named in a similar fashion to directories in a hierarchical file system. Every node in a preference tree has a node name (which is not necessarily unique), a unique absolute path name , and a path name relative to each ancestor including itself. The root node has an absolute path name of "/". Children of the root node have absolute path names of "/" + <node name> . All other nodes have absolute path names of <parent's absolute path name> + "/" + <node name> . Note that all absolute path names begin with the slash character. Each Preference node has zero or more properties associated with it, where a property consists of a name and a value. The bundle writer is free to choose any appropriate names for properties. Their values can be of type String,long,int,boolean, byte, float, or double but they can always be accessed as if they were String objects. Unusual names -"." and ".." have no special significance in path names. Throws BackingStoreException– if this operation cannot be completed due to a failure in the backing store, or inability to communicate with it. IllegalStateException– if this node (or an ancestor) has been removed with the removeNode() method. □ Removes all of the properties (key-value associations) in this node. This call has no effect on any descendants of this node. □ Forces any changes in the contents of this node and its descendants to the persistent store. key key whose associated value is to be returned. def the value to be returned in the event that this node has no value associated with key or the backing store is inaccessible. □ Returns the value associated with the specified key in this node. Returns the specified default if there is no value associated with the key, or the backing store is inaccessible. Returns the value associated with key, or def if no value is associated with key. Throws IllegalStateException– if this node (or an ancestor) has been removed with the removeNode() method. key key whose associated value is to be returned as a boolean. def the value to be returned in the event that this node has no value associated with key or the associated value cannot be interpreted as a boolean or the backing store is inaccessible. □ Returns the boolean value represented by the String object associated with the specified key in this node. Valid strings are "true", which represents true, and "false", which represents false. Case is ignored, so, for example, "TRUE" and "False" are also valid. This method is intended for use in conjunction with the putBoolean(String, boolean) method. Returns the boolean value represented by the String object associated with key in this node, or null if the associated value does not exist or cannot be interpreted as a boolean. Throws NullPointerException– if key is null. key key whose associated value is to be returned as a byte object. def the value to be returned in the event that this node has no value associated with key or the associated value cannot be interpreted as a byte type, or the backing store is inaccessible. □ Returns the byte value represented by the String object associated with the specified key in this node. Valid String objects are Base64 encoded binary data, as defined in RFC 2045 , Section 6.8, with one minor change: the string must consist solely of characters from the Base64 Alphabet ; no newline characters or extraneous characters are permitted. This method is intended for use in conjunction with the putByteArray(String, byte) method. Returns the byte value represented by the String object associated with key in this node, or def if the associated value does not exist or cannot be interpreted as a byte. key key whose associated value is to be returned as a double value. def the value to be returned in the event that this node has no value associated with key or the associated value cannot be interpreted as a double type or the backing store is inaccessible. □ Returns the double value represented by the String object associated with the specified key in this node. The String object is converted to a double value as by Double.parseDouble(String). Returns the specified default if there is no value associated with the key, the backing store is inaccessible, or if Double.parseDouble(String) would throw a NumberFormatException if the associated value were passed. This method is intended for use in conjunction with the putDouble method. Returns the double value represented by the String object associated with key in this node, or def if the associated value does not exist or cannot be interpreted as a double type. NullPointerException– if key is null. key key whose associated value is to be returned as a float value. def the value to be returned in the event that this node has no value associated with key or the associated value cannot be interpreted as a float type or the backing store is inaccessible. □ Returns the float value represented by the String object associated with the specified key in this node. The String object is converted to a float value as by Float.parseFloat(String). Returns the specified default if there is no value associated with the key, the backing store is inaccessible, or if Float.parseFloat(String) would throw a NumberFormatException if the associated value were passed. This method is intended for use in conjunction with the putFloat(String, float) method. Returns the float value represented by the string associated with key in this node, or def if the associated value does not exist or cannot be interpreted as a float type. key key whose associated value is to be returned as an int . def the value to be returned in the event that this node has no value associated with key or the associated value cannot be interpreted as an int or the backing store is inaccessible. □ Returns the int value represented by the String object associated with the specified key in this node. The String object is converted to an int as by Integer.parseInt(String). Returns the specified default if there is no value associated with the key, the backing store is inaccessible, or if Integer.parseInt(String) would throw a NumberFormatException if the associated value were passed. This method is intended for use in conjunction with the putInt(String, int) method. Returns the int value represented by the String object associated with key in this node, or def if the associated value does not exist or cannot be interpreted as an int type. key key whose associated value is to be returned as a long value. def the value to be returned in the event that this node has no value associated with key or the associated value cannot be interpreted as a long type or the backing store is inaccessible. □ Returns the long value represented by the String object associated with the specified key in this node. The String object is converted to a long as by Long.parseLong(String). Returns the specified default if there is no value associated with the key, the backing store is inaccessible, or if Long.parseLong(String) would throw a NumberFormatException if the associated value were passed. This method is intended for use in conjunction with the putLong(String, long) method. Returns the long value represented by the String object associated with key in this node, or def if the associated value does not exist or cannot be interpreted as a long type. Returns an array of the keys that have an associated value in this node. □ Returns this node's name, relative to its parent. pathName the path name of the Preferences object to return. □ Returns a named Preferences object (node), creating it and any of its ancestors if they do not already exist. Accepts a relative or absolute pathname. Absolute pathnames (which begin with '/') are interpreted relative to the root of this node. Relative pathnames (which begin with any character other than '/') are interpreted relative to this node itself. The empty string ("") is a valid relative pathname, referring to this node itself. Returns the specified Preferences object. Throws IllegalArgumentException– if the path name is invalid. NullPointerException– if path name is null. pathName the path name of the node whose existence is to be checked. □ Returns true if the named node exists. Accepts a relative or absolute pathname. Absolute pathnames (which begin with '/') are interpreted relative to the root of this node. Relative pathnames (which begin with any character other than '/') are interpreted relative to this node itself. The pathname "" is valid, and refers to this node itself. If this node (or an ancestor) has already been removed with the removeNode() method, it is legal to invoke this method, but only with the pathname ""; the invocation will return false. Thus, the idiom p.nodeExists("") may be used to test whether p has been removed. Returns true if the specified node exists. IllegalStateException– if this node (or an ancestor) has been removed with the removeNode() method and pathname is not the empty string (""). IllegalArgumentException– if the path name is invalid (i.e., it contains multiple consecutive slash characters, or ends with a slash character and is more than one character long). □ Returns the parent of this node, or null if this is the root. Returns the parent of this node. key key with which the specified value is to be associated. value value to be associated with the specified key. □ Associates the specified value with the specified key in this node. Throws NullPointerException– if key or value is null. key key with which the string form of value is to be associated. value value whose string form is to be associated with key . □ Associates a String object representing the specified boolean value with the specified key in this node. The associated string is "true" if the value is true, and "false" if it is false. This method is intended for use in conjunction with the getBoolean(String, boolean) method. Implementor's note: it is not necessary that the value be represented by a string in the backing store. If the backing store supports boolean values, it is not unreasonable to use them. This implementation detail is not visible through the Preferences API, which allows the value to be read as a boolean (with getBoolean ) or a String (with get) type. value value whose string form is to be associated with key. □ Associates a String object representing the specified byte with the specified key in this node. The associated String object the Base64 encoding of the byte, as defined in RFC 2045 , Section 6.8, with one minor change: the string will consist solely of characters from the Base64 Alphabet ; it will not contain any newline characters. This method is intended for use in conjunction with the getByteArray(String, byte) method. Implementor's note: it is not necessary that the value be represented by a String type in the backing store. If the backing store supports byte values, it is not unreasonable to use them. This implementation detail is not visible through the Preferences API, which allows the value to be read as an a byte object (with getByteArray) or a String object (with get ). □ Associates a String object representing the specified float value with the specified key in this node. The associated String object is the one that would be returned if the float value were passed to Float.toString(float). This method is intended for use in conjunction with the getFloat(String, float) method. □ Associates a String object representing the specified int value with the specified key in this node. The associated string is the one that would be returned if the int value were passed to Integer.toString(int). This method is intended for use in conjunction with getInt(String, int) method. □ Associates a String object representing the specified long value with the specified key in this node. The associated String object is the one that would be returned if the long value were passed to Long.toString(long). This method is intended for use in conjunction with the getLong(String, long) method. key key whose mapping is to be removed from this node. □ Removes the value associated with the specified key in this node, if any. The removal is not guaranteed to be persistent until the flush method is called on the parent of this node. Throws IllegalStateException– if this node (or an ancestor) has already been removed with the removeNode() method. BackingStoreException– if this operation cannot be completed due to a failure in the backing store, or inability to communicate with it. □ Ensures that future reads from this node and its descendants reflect any changes that were committed to the persistent store (from any VM) prior to the sync invocation. As a side-effect, forces any changes in the contents of this node and its descendants to the persistent store, as if the flush method had been invoked on this node. Each bundle using this service has its own set of preference trees: one for system preferences, and one for each user. A PreferencesService object is specific to the bundle which obtained it from the service registry. If a bundle wishes to allow another bundle to access its preferences, it should pass its PreferencesService object to that bundle. □ Returns the root system node for the calling bundle. Returns The root system node for the calling bundle. name The user for which to return the preference root node. □ Returns the root node for the specified user and the calling bundle. Returns The root node for the specified user and the calling bundle. □ Returns the names of users for which node trees exist. Returns The names of users for which node trees exist.